Pete Cashmore's social media news blog is known for covering stories about the ever changing web and how to better interact with it, but it also has an offline presence. Mashable's founder likes to travel around the country and meet the folks that read his blog. Pete Cashmore's social media news blog is known for covering stories about the ever changing web and how to better interact with it, but it also has an offline presence. Mashable's founder likes to travel around the country and meet the folks that read his blog. This is a rare occurrence in media; you rarely get to meet the people to deliver news to you. 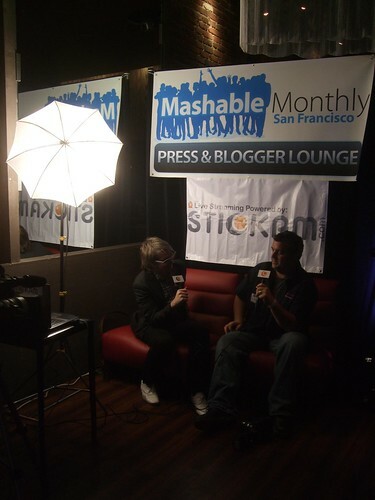 The first ever Mashable Monthly was held at Roe in SOMA, and according to Cashmore, it was a success. There was a blogger lounge; a place for people to bust out there laptops and write posts or conduct interviews. These networking events are my favorite because you arrive with a stack of your business cards, and leave with a handful of new ones. Live video startup Stickam was set up in front, helping people do interviews. There is a bunch of videos recorded from the session here.